At least 29 people, most of them rebel fighters, have been killed in a bombing near Syria's border with Turkey, activists say. 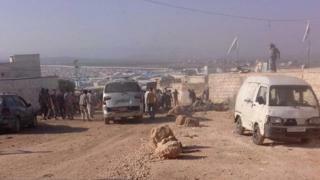 The attack reportedly occurred during a change of guard at the rebel-controlled Atmeh crossing, in Idlib province. It was not immediately clear whether the blast was caused by a suicide bomber or a remote-controlled device. A news agency linked to so-called Islamic State (IS) said a suicide car bombing had targeted a rebel convoy. But an opposition activist network, the Local Co-ordination Committees, reported that a suitcase filled with explosives had been planted at the scene. In mid-August, 32 rebels were killed in a suicide attack claimed by IS at the Atmeh crossing, which they use to travel from Idlib, via Turkey, to battle the jihadist group in other parts of north-eastern Syria. The LCC reported that 30 people had been killed and 40 others wounded in Thursday morning's attack, while the UK-based Syrian Observatory for Human Rights put the death toll at 29. Photographs and videos purportedly of the aftermath showed the bloodied bodies of more than 20 men, some of them wearing camouflage trousers. Turkey's deputy prime minister called the attack a "crime against humanity". The president of the Higher Judicial Council in the rebel-held east of the nearby city of Aleppo, Sheikh Khaled al-Sayyed, its attorney-general Mohammed Faraj, and a field commander of the rebel group Ahrar al-Sham, Husham Khalifa, were among those killed, the LCC said. But most of the victims were Faylaq al-Sham fighters. The rebel faction is participating in a Turkish-led offensive against IS militants and Kurdish fighters along another stretch of border, 60km (37 miles) to the north-east. The rebels - assisted by Turkish warplanes, tanks and artillery - quickly seized the former IS stronghold of Jarablus in late August and are now heading towards Dabiq. The small town holds great symbolic value to jihadists as it is named in Islamic apocalyptic prophecies as the site of an end-of-times showdown between Muslims and their "Roman" enemies - a term IS has now expanded to include the US and its allies. BBC Turkey correspondent Mark Lowen says Thursday's attack by IS highlights the danger of the mission - Turkey's biggest offensive in Syria since the country's war began in 2011. Ankara says it will push on with Operation Euphrates Shield, hoping to create a de facto buffer zone close to its vulnerable border, to where some of the 1.5 million Syrian refugees sheltering in Turkey could return.